Here's a fun and easy idea to give that little table that's hanging out in your basement a new lease on life. This sweet little table below actually came from the family ranch where my father-in-law spent his childhood summers. The hubby and I inherited it from his grandma many years ago. I love it! It is a sturdy little thing that was probably made out of scrap wood at one point. I wanted to use it as a side table in our bedroom, but it was looking a little worse for the wear. I wanted to dress it up a little bit, so I just added some pretty tan linen to the top with nothing more than some upholstery tacks. I cut the fabric a little larger than the table top. Then all I did was fold the raw edges under and wrap the fabric around the table top. I secured it on the sides with upholstery tacks. Making nice tight "hospital" folds at the corners. I didn't want to spend any money on this project so I just used upholstery tacks I had lying around, but I plan on dressing the look up even further in the future by purchasing the "rope" tacks to fill in the gaps - like the table in the inspiration picture. But for now I think it looks great! Wow, I'm first! 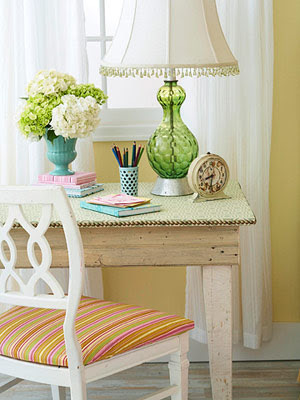 LOVE the table, that's a great idea for covering a table top that's been "LOVED" a little too much! Oh my goodness!!! What a great idea!!! What a neat idea. I may have to try that with my dresser. Great idea. I'm a table collector and this idea could come in pretty handy! Hi! I'm stopping by from Sandy Toes' place. Great job on that table! Don't you love it when you can breathe new life into something you had sitting around the house? It's the best! I love it, I want to try it! What a great idea. I love that it adds texture to the room! I truly enjoy your blog!! It is so funny how ideas float around. I was just at a friends house today admiring all of her gorgous, vintage, rustic coffee and side tables. They were in every room and they were all so remarkable in their own way! I'm inspired! Fantastic! I love furniture with history. It connects us to our past and provides our children a link to the future. Thank you for sharing. I LOVE this! What an awesome idea and it looks Fabulous! Hopping over from ASPTL...I love that idea! I have a couple tables I need to do that with. Wanted to pop over from Kimba to see what you were up to. Great idea!